Childe Hassam – Smith College Museum of Art 1905.3.1. 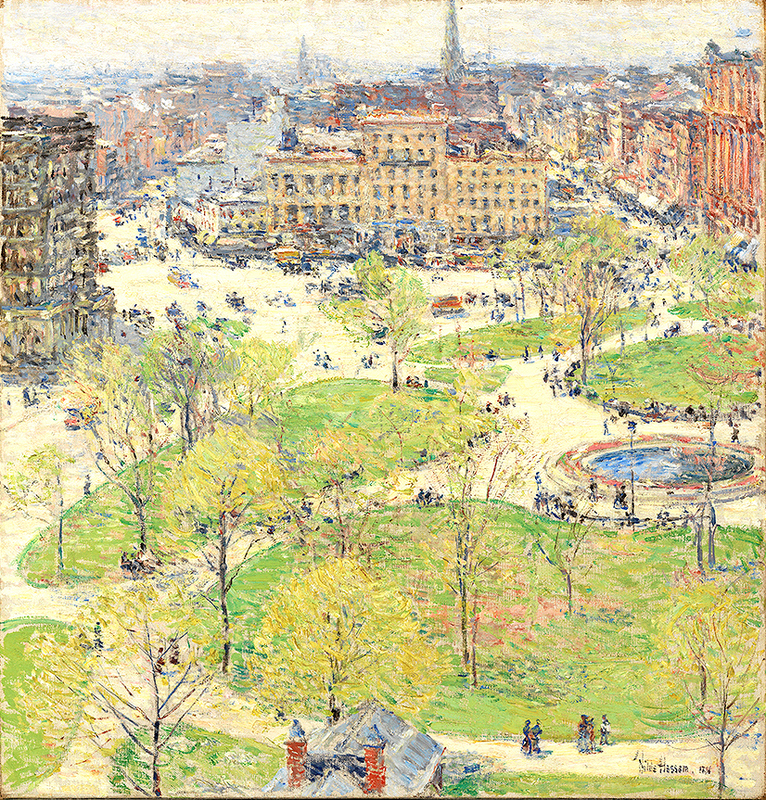 Title: Union Square in Spring. Date: 1896. Materials: oil on canvas. Dimensions: 54.6 x 53.3 cm. 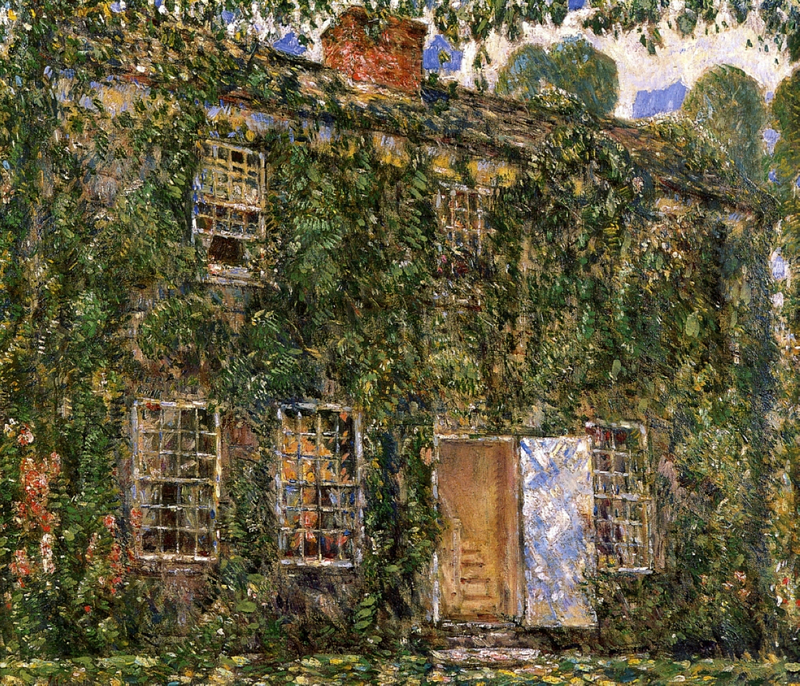 Source: http://museums.fivecolleges.edu/detail.php?museum=all&t=objects&type=all&f=&s=hassam&record=42. I have changed the light and contrast of the original photo. Childe Hassam – private collection. Title: Paris, Winter Day. Date: 1887. Materials: oil on canvas. Dimensions: 45 x 81.3 cm. Sold by Sotheby’s in New York, on May 21, 2009. Source: http://www.sothebys.com/content/dam/stb/lots/N08/N08555/N08555-68-lr-1.jpg. I have changed the light and contrast of the original photo. Materials: oil on canvas. Dimensions: 52.7 x 61 cm. Source: http://www.the-athenaeum.org/art/display_image.php?id=57262. I have changed the light of the original photo. Materials: oil on canvas. Dimensions: 34.9 x 41.6 cm. 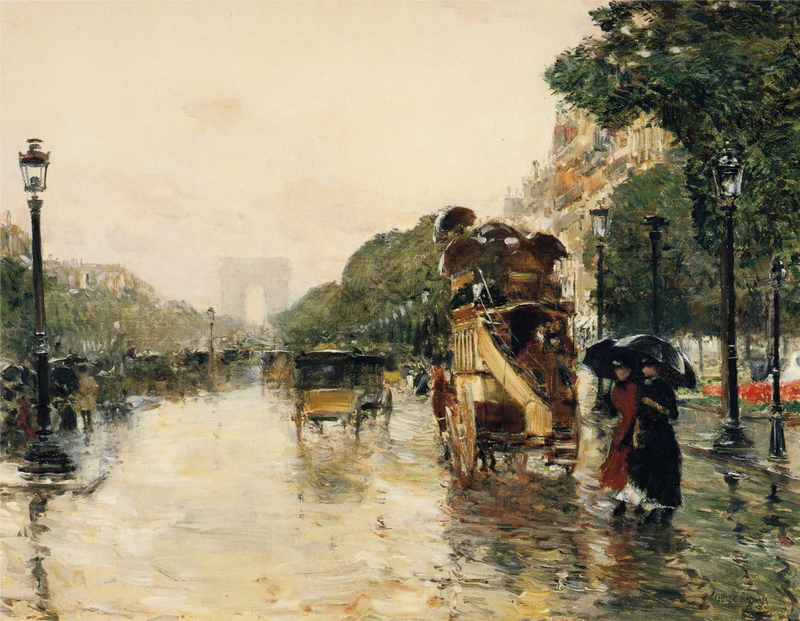 http://commons.wikimedia.org/wiki/File:Childe_Hassam_-_Champs_Elys%C3%A9es,_Paris.JPG. Painted at a time when urban landscapes were still a novel subject in the United States, Rainy Day, Boston depicts the intersection of Columbus Avenue and Appleton Street in Boston’s South End. When Childe Hassam painted this picture, he and his wife lived at 282 Columbus Avenue. 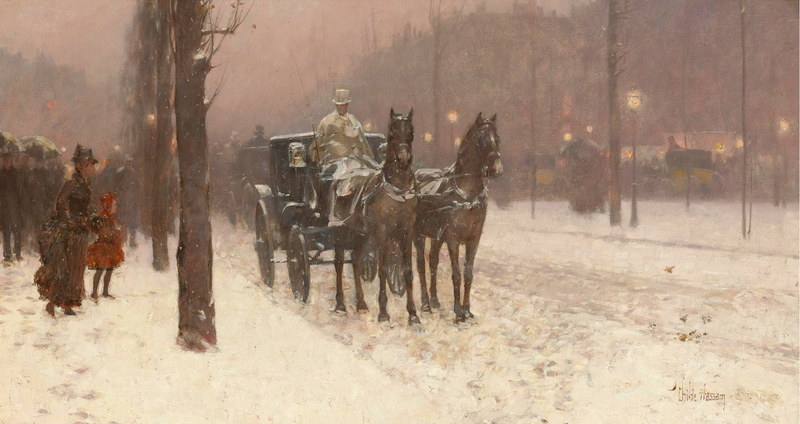 According to the artist, “The street was all paved in asphalt, and I used to think it very pretty when it was wet and shining, and caught the reflections of passing people and vehicles.” In this view seen through the atmospheric filter of rain, Hassam accentuated the pictorial effects produced by the light and the weather conditions. Rain causes the broad expanse of pavement to glisten with reflections and casts a soft rosy tone over the damp red bricks. The overcast sky and pearly light produce a misty atmosphere that enshrouds buildings and pedestrians alike, and—combined with the muted palette of dull pinks, grays, and blacks—unifies the composition. Rainy Day, Boston also celebrates Boston’s fashionable, clean, and spacious cityscape. Hassam had been to Europe in 1883 and had seen the new appearance of Paris with its wide boulevards created by Baron Haussmann for Napoleon III. This painting’s wide angle of vision, uncluttered setting, and deep perspective recall Haussmann’s municipal improvements, which had inspired Boston’s own concurrent developments in the 1860s and 1870s. They also suggest the influence of photography, still relatively new. Hassam’s interest in showing the effects of weather and the subject of city life with its to-and-fro bustle indicate that here, in his first major oil painting, he was trying out for an American audience the modern urban theme so embraced by the French Impressionists that he had encountered in Paris (http://classes.toledomuseum.org:8080/emuseum/view/objects/asitem/search$0040/2/invno-asc?t:state:flow=c2993ae1-2e9a-439f-aec4-14c7a12920a8).